Information: Heavy weight Pacific locomotives designed for Top Link passenger services on the Southern Railway were conceived during hostilities of World War 2. The Merchant Navy class were nicknamed “Spam Cans” due to their unorthodox appearance. A total of 30 locomotives were constructed, all named after steam ship lines operating out of Southampton Docks. 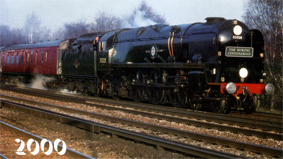 In accordance with their powerful stature the Merchant Navy’s were entrusted premiere passenger trains, such as the all Pullman Bournemouth Belle and Golden Arrow. Details: By 1945 plans for electrification of the Southern Railway was already in progress. But just a few years prior, when the Merchant Navy Class had been introduced in 1941 the need for express passenger services on the busiest routes could only be entrusted to steam locomotive technology. Because of weight load restrictions and size, the Merchant Navy Class could not be used universally through-out the region but was successful on the mainline routes out of London. Features employed on the Merchant Navy Class included novel designs for the day in Britain, such as the Boxpox wheels, chain drive, welded firebox construction, and electric lighting. Initial deliveries of a batch of ten West Country locomotives built at Brighton Works commenced in February 1941. Upon completion of extensive trials and modifications to the first two class members, the remainder were of the first batch was completed by the following July. A second batch of ten was commissioned in 1944, while a final order for ten further locomotives was completed after Nationisation of British Railways in 1949. In service the locomotives were able performers, later designated Class 8P. Weight restrictions severely limited route availability of the class also contributing to complaints of wheel slippage. Problems also arose from maintenance associated the chain drive linkage. After an accident April 1953 involving 35020 “Bibby Line” at Crewkerne, where the crank axle on the center driving wheel fractured at speed a decision was made to withdraw the entire Class. At first, consideration was given to scrapping the whole class in favour of replacing them with Standard Britannia locomotives, but as the Merchant Navy’s had proven themselves with sterling performances and as such a decision was made to rebuild the entire class to conventional steam principals. Between 1956 and 1960 the entire class was rebuilt with lessons learned being applied to many Battle of Britain / West Country cousins. Liveries carried include the original Malachite Green, affectionately known as “Sunshine Green” with yellow lining was employed by the Southern Railway. The Merchant Navy’s also were one of the few classes to carry the experimental blue livery proposed by British Railways for express passenger locomotives. Ultimately, all members were painted British Railways Brunswick Green with orange and black lining. After the costly rebuilding program was complete, many members had surprisingly short life spans. By 1964 withdrawals commenced and by July 1967, along with all remaining steam on the Southern Region the fires were dampened for the final time. To date, 11 members survive in various stages of preservation, some in full working order. Unfortunately, one of the class down-falls, route restrictions due to weight has meant that they have limited use in preservation circles. One interesting display, incorporated in the National Railway Museum at York includes a full sized sectioned locomotive No. 35029, “Ellerman Lines” used to demonstrate the workings of a steam locomotive.